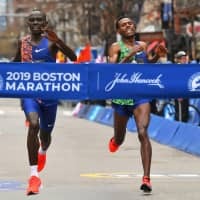 BOSTON - Two-time Boston Marathon champion Lelisa Desisa turned onto Boylston Street with a sliver of a lead, leaning in front of two other runners with the finish line in sight. Hiroto Inoue finished 12th, best among Japanese runners. Inoue, who won marathon gold at last year’s Asian Games, crossed the finish line in 2:11: 53. 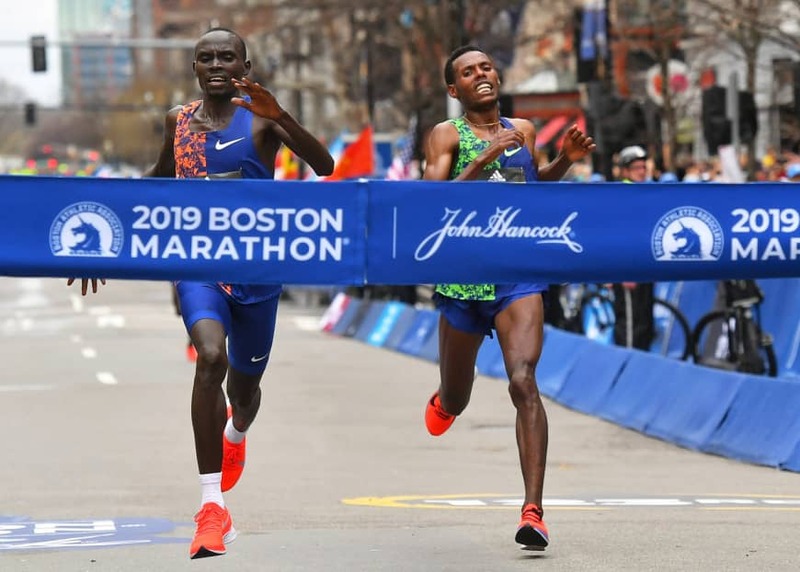 The 26-year-old ran in the vanguard until starting to drop off the pace at the grueling “Heartbreak Hill”, which starts around the 32-km mark, and seemed exhausted by the time he reached the top. Yasushi Sakaguchi, a coach from the Japan Association of Athletics Federations in charge of Olympic training, gave Inoue a grade of 75 for his performance. “I felt once again how strong the top competitors are,” Sakaguchi said. Defending champion Yuki Kawauchi finished 17th in a time of 2:15:29. Worknesh Degefa broke away from defending champion Des Linden and the rest of the women’s pack in the Framingham flats and ran alone for the last 32 km to claim the $150,000 first prize and a gilded olive wreath from Marathon, Greece. But with conditions back to normal, so were the results: East Africans from Kenya and Ethiopia dominating the podiums. At the 30-km mark the lead pack was still close to a dozen and included three of the last four champions: Desisa, 2016 winner Geoffrey Kirui and ’17 champ Lemi Berhanu Hayle. A field of 30,000 runners followed the elites, ditching their trash bags and ponchos on the Hopkinton Green before embarking on the 42.17-km trek from Hopkinton to Copley Square. It’s the first time the race has been run on April 15 since the 2013 attacks; officials held a ceremony at 2:49 p.m. to honor those killed and maimed by the two pressure cooker bombs that exploded near the finish line.